STOP PRESS: FOR A 10% DISCOUNT ON THESE WINES JUST MENTION THIS ARTICLE WHEN YOU CONTACT sales@ten-acre.com OR USE CODE Aigueliere10 AT CHECKOUT. 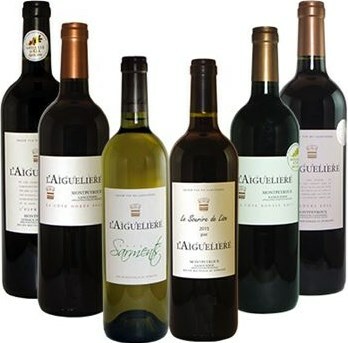 Domaine l’Aiguelière is a partnership formed 30 years ago between Aimé Commeyras, from an old family of vine growers in the Montpeyroux region of the Languedoc, and Dr. Pierre-Louis Teissedre, Professor of oenology at the University of Bordeaux. The Domaine sprang to international attention when critic Robert Parker awarded scores of 95 and 96 to their top cuvées, the Côte Rousse and Côte Dorée, two almost all-Syrah bottlings, from different soils and vineyards, that also appear to me to be extremely well priced for the obvious quality, both still under £20 per bottle. After the death of Aimé, his younger brother Auguste took up the winemaking reins, assisted by Marc Esclarmonde, a young and very competent oenologist, and the team is now supplemented by Yu Huang, a student from China who stayed on at the domaine following a very successful internship. 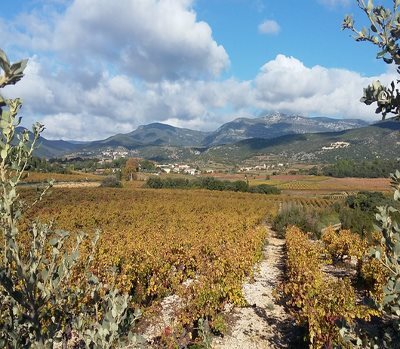 Montpeyroux lies around 15 kilometres east of Montpellier, a sub-region of the Terrasses du Larzac appellation which itself was granted full appellation status only in 2014, though it has long been recognised as one of the best terroirs of the Languedoc. That’s thanks to its proximity to the Massif Central mountain range which creates a large diurnal shift (difference between hot day and cool night temperatures, especially in summer) and the diversity of soils including sandy clay, iron-rich red earth and some with high limestone content. Domaine l’Aiguelière’s 22 hectares of vineyard are divided into 19 separate plots, at varying altitudes, the most prized slopes consisting of clay soils over limestone. The domaine has minimal need to use any vineyard sprays, and puts this down to the freshening breezes blowing off of the mountains. Yields never exceed 25hl/ha and are often much lower. The Commeyras family still focus on research and precision in their farming and winemaking, consistent qualities instilled by the founders, who combined their winegrowing and academic knowledge. In fact, the Commeyras family had been winegrowers in the region for many generations, but it was Aimé’s dissatisfaction with the wines others were producing from his grapes that was the impetus to create Domaine l’Aiguelière. (2018) A blend of Grenache and Syrah made in stainless steel, this is all about the dense and deep black cherry and clove-infused plum compote fruit on the nose, moving smoothly through to the palate where a very nice axis of creamy but firm tannin and juicy cherry-skin acidity cuts through the creamy ripeness of the fruit. Tangy, quite spicy and long, the palate has it's serious side for sure with the extraction nicely judged to give a bit of real grip. (2018) Syrah and Grenache with a touch of Mourvèdre, this cuvée comes from the Terrasses du Larzac appellation in the Languedoc and is aged in oak barrels. Dark and saturated, meatiness, a touch of sizzling bacon fat, is added to the plummy dark fruit. In the moouth the sweet ripeness of the fruit impresses, a flood of bittersweet cherry and blueberry, the oak adding just a sheen of smokiness and roundness to what remains an essentially fruit-driven (and delicious) wine. (2018) Also from the Terrasses du Larzac's clay and limestone soils, a blend of 20-year-old Syrah and Grenache with just 2% Mourvèdre, this cuvée vinified in stainless steel. Crushed raspberry notes add lift to the black fruits here, a hint of camphor, of leafy twigs, all quite different from the Velour cuvée aromatically. In the mouth the two draw closer, as the meaty substance of the ripe fruit darkens the picture, but there's a dimension of juiciness, traded against the smoothing breadth of the Velours, that makes this equally appealing. Is the alcohol a touch more prominent in this differently structured wine? Maybe, but for me it retains balance and even some elegance. (2018) Here we have 98% Syrah, from 35-year-old vines in Montpeyroux, harvested at just 20hl/ha - a very, very low yield and only 6,000 bottles produced. This cuvée spends eight months in oak barrels from Nièvre. Another densely-hued wine, the ramping up of concentration is noticeable immediately, dark, tightly-wound aromas of damson plum, peppercorn and liquorice, muscular and dense, but with a glimpse of brighter raspberry and violet, a wisp of curling bonfire smoke. Super stuff in the mouth: such a beautifully slick but firm and grippy, youthful palate, etched by its acidity and tannin framework, but the effortless concentration of fruit suggesting significant ageing potential too. (2018) "Almost 100% Syrah," according to the back label, this comes from 60-year-old vines planted clay-limestone soils. Again the yield is tiny, and the wine was vinified in new Alliers oak. Côte Dorée is a special selection and limited release, and though this 2011 is currently unavailable from Ten Acre Wines, the 2013 is listed at £19.95. If the Côte Rousse is dark, deep and sensuous, then at seven years of age this is all that and more: a deep pool of polished black fruits and spices, again we have that tiny lift of pepper and floral character, but it's a hugely tightly-wound wine that needs a little air and/or a little time. In the mouth the age has softened the edges, but still this is a concentrated, ripe but bittersweet melange of black fruits, savoury meatiness, and tangy cherry skin acidity that keeps the finish fresh and lip-tingling. A huge wine in its way, but with 13.5% alcohol and perfect balance, deeply impressive. The Rousse has a little more light and shade, this is a walk further into the dark side.